Crawl Scope allow users to define a separate seed URL our crawler should start crawling from apart from the main tracking URL of the campaign. For example, you own example.com and you want to track rankings for any subfolders / subdomains under this root domain - So you'd want to use example.com as the campaign's tracking URL (See this article for how ranking scope works). 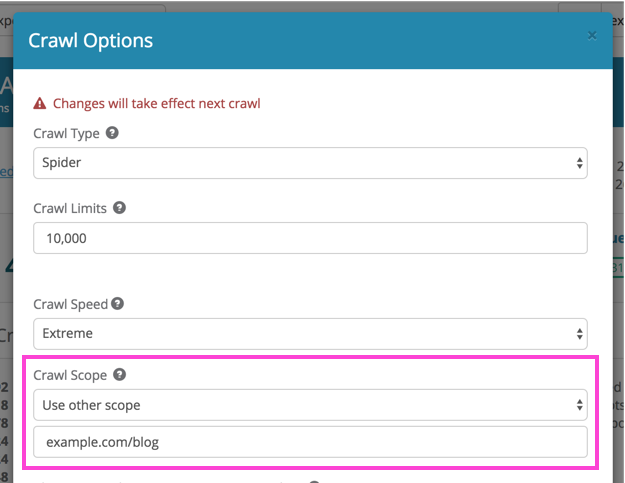 But for site crawls, you might only be interested in getting onsite data for the blog section of the website, you can use to Crawl Scope option to define example.com/blog as the Crawl Scope. If Same as main site is selected, the main tracking URL of the campaign will be used. To use a different URL, choose Use other scope and enter the URL in the text box.